Tendonitis of your shoulder is an inflammation of your rotator cuff or biceps tendon. Your rotator cuff consists of the muscles and tendons in your shoulder. They connect your upper arm bone to your shoulder blade. Your injury may range from mild inflammation to severe inflammation of most of your rotator cuff. When your rotator cuff tendon becomes inflamed and thickened, it is also called rotator cuff tendonitis. Your rotator cuff tendon may get trapped under the roof, or highest point, of your shoulder. This is called your acromion. It is formed by a part of your shoulder blade, called your scapula. Shoulder tendonitis is usually the result of a tendon being pinched by surrounding structures. Shoulder tendonitis often happens in certain sports that require your arm to move over your head repeatedly. Such sports include baseball, weightlifting, volleyball, racket sports, and certain swimming strokes. What are the symptoms of shoulder tendonitis? The symptoms of shoulder tendonitis may resemble other conditions or medical problems. Always talk with your healthcare provider for a diagnosis. How is shoulder tendonitis diagnosed? X-ray. Invisible electromagnetic energy beams produce images of internal tissues, bones, and organs onto film. 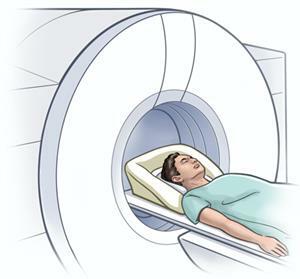 Magnetic resonance imaging, or MRI. Large magnets and a computer produce detailed images of organs and structures within your body. Ultrasonography. High frequency sound waves create an image of some part of the inside of your body. 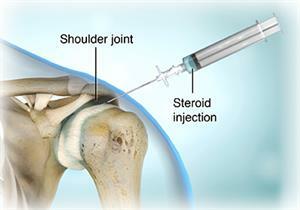 How is shoulder tendonitis treated? What are the complications of shoulder tendonitis? Pain that interrupts your sleep. Loss of strength or motion in your affected arm. Difficulty doing things that require moving your injured arm behind your back or overhead, such as fastening zippers or buttons, or placing objects in high places. Tendonitis of your shoulder is an inflammation of your rotator cuff and/or biceps tendon. It usually results from your tendon being pinched by surrounding structures. You can develop shoulder tendonitis from participating in certain sports that require the arm to move over the head repeatedly. These sports may include baseball, weightlifting, volleyball, racket sports, and certain swimming strokes. Inability to hold your arm in certain positions, and/or pain or tenderness in your shoulder. Diagnosis can be made from a history, physical examination, and using X-ray, MRI, and ultrasonography. Treatment may include rest and nonsteroidal anti-inflammatory medicines among other things. Surgery is reserved for severe injuries.